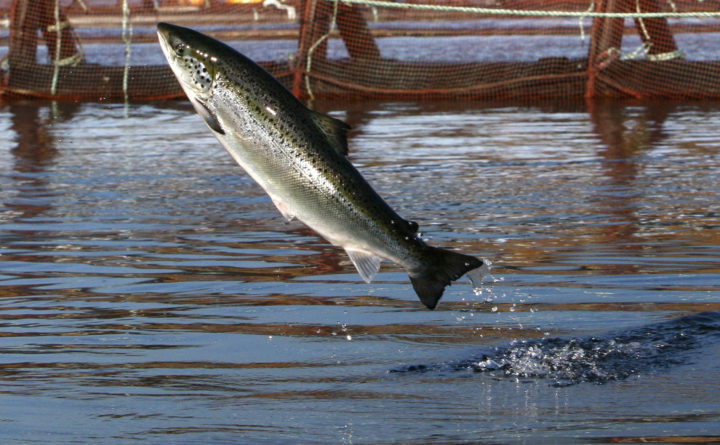 An Atlantic salmon leaps in an aquaculture farm pen near Eastport, Oct. 11, 2008. A subsidiary of Nordic Aquafarms is planning a California facility similar to its proposed Belfast salmon farm. While city officials and proponents have touted the property taxes and jobs that could come from the development, the project has flared tempers in the small coastal city. Concerns about adverse impacts on the midcoast environment and Belfast’s sense of community rank high among opponents’ objections. The Belfast project continues to work its way through the permitting process. The proposed California project could cost more than $400 million and create about 80 jobs, according to Nordic Aquafarms. If developed, the facility could produce about 55 million pounds of fish per year. The company is still exploring whether to raise salmon or steelhead trout at the proposed facility. The final decision will be made based on market considerations and discussions with local permitting authorities, according to Nordic Aquafarms. For the Belfast project, Nordic Aquafarms submitted its first permit application in October. The company still has to secure several more federal, state and local permits before it can move forward with construction. The company anticipates breaking ground later this year, with the project being completed in 2020. The company plans to submit permit applications for the California project by the spring of 2020.